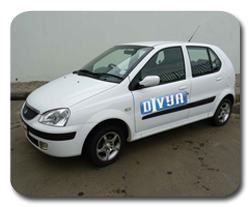 Divya Travels has begun “Rent – A – Cab” services in the year 2008. Since then our mission is to provide world class car rental services in Ahmedabad at such a competitive price which is offered by "around the corner" other local rental car providers. We keep our operating costs at the lowest with the smart use of technology to provide excellent services and pass on the same savings to our customers in term of comparative low rates. We guarantee to provide both on-road and online safety for our customers. For on-road safety, we provide new, clean and well maintained cars and hire courteous and experienced chauffeurs only who are well versed with regional routes. For online safety, we ensure the privacy of your information which has been used in the period of our services to you. We strive to continually improve our services to offer you best ever experience with our company and your positive feedback is very important to us. In case of any questions or suggestions/complaints, either fill the form below or drop us an email at info@divyatravels.in. One of our representatives will reply to you within 24 hours.